– The fact that a wire harness is hidden inside the machine, doesn’t mean it shouldn’t be neat. Bart Maes, Group purchase manager at Belgian harvester specialist Dewulf, never compromises with quality. Dewulf is the world’s foremost full-line supplier of potato and root crop processing machinery. With three locations in Belgium, the Netherlands and Romania, the company leads the industry in the development and production of agricultural machinery for soil cultivation, planting, harvesting, grading, storage and transport of potatoes and root crops. The fact that Dewulf is of Belgian origin is no co-incidence, explains Bart Maes. – Belgium is the global leader within the potato processing industry and an European leader in the frozen vegetable sector. 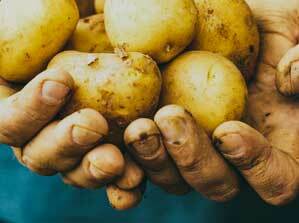 Neighbouring the Netherlands is the leading producer of seed potatoes worldwide. Dewulf is a family business with a rich 70 year history and is currently under management of the third generation. Innovation, reliability, enjoyable collaboration and assisting the customer in finding the most economical solution are the cornerstones of Dewulf ’s business strategy. In 2016, with a close-knit team of 290 employees, the group achieved a turnover of 65 million euros. The first chapter in the story of Rimaster and Dewulf was written two years ago. Dewulf had initated a pitch in order to find a new supplier of wire harnesses. Several competitors were invited, Bart Maes tells. – The suppliers were asked to produce samples of the wire harnesses with and without braiding, making it possible for us to evaluate quality as well as material and craftmanship. The pitch had four different stages – Rimaster was eliminated after the third and the job went to someone else. – After a procurement, we always invite the suppliers that did not get the offer to a debrief. This time, Rimaster were the only ones that showed up. We ended up having a long meeting with an intense discussion about Dewulf ’s demands and how to meet the tough conditions related to this kind of special vehicles. I showed a lot of pictures and they asked a lot of questions, says Bart Maes who himself has a long experience from developing wire harnesses and braiding technology. Three months later he got a call from Jean-Pierre Vanheel, Managing Director of Rimaster Belgium. – He told me that they had made a new sample that they wanted me to see. Actually I was surprised – that doesn’t happen a lot. And Rimaster had really done their homework. This time they had gotten it all right. As we are an open minded organization, and really like being listened to, we decided that we had room for one more supplier. Rimaster’s ability to listen and respond to Dewulfs’ requirements is the momentum behind the collaboration. – We also appreciate Rimaster’s high quality standards and delivery performance. The Polish production plant has good quality routines and I think that the ongoing automatization project will further add to its deliverability. The fact that Rimaster is locally present in Belgium is of course an advantage, Bart Maes states. Rimaster’s high mix low volume offer is a perfect match for this kind of special vehicles. What started off with delivieries of wire harnesses for carrot processing machinery for Dewulf and its Dutch sister company Miedema now continues with wire harnesses for the group’s potato processing segment. With its global precense, Dewulf is the second largest player in the world within the industry – and the business is growing. – The fast development of the agricultural sector provides new opportunities. Some countries, for example South Africa, are now switching from harvesting by hand to machines. In China we see a readjustment from rice to potatoes. Production of rice requires large areas meaning that the yield for potatoes is better per hektar than rice.